It is time to cancel the apocalypse again. The first trailer for Pacific Rim Uprising has arrived. Pacific Rim Uprising is the sequel to Guillermo del Toro's 2013 film Pacific Rim, which a cinematic love letter to classic mech and monster anime and manga. Pacific Rim Uprising takes place ten years after the Battle of the Breach in the original Pacific Rim. The Kaiju threat has subsided, but the Pan Pacific Defense Corp's Jaeger program is more robust than ever and continues to await the Kaiju's return. John Boyega plays Jake Pentecost, the son of Stacker Pentecost, the high-ranking PPDC officer who was played by Idris Elba in the first film. Stacker was the commanding officer of Raleigh Beckett and adoptive father of Mako Mori. Jake will pilot the Jaeger called Gypsy Avenger, the namesake of Raleigh's Jaeger Gypsy Danger. Rinko Kikuchi will reprise her role as Mako. Charlie Day and Burn Gorman will also return for the sequel. New cast members include Scott Eastwood, Cailee Spaeny, Adria Arjona, and Jing Tian. Del Toro remains on board the sequel as a producer and with a "story by" credit but cedes the director's chair to Steven S. DeKnight, best known for his work on television series like Spartacus and Marvel's Daredevil. 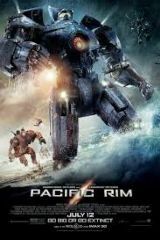 The original Pacific Rim earned generally positive reviews but a disappointing domestic box office of $101 million. However, a strong international box office boosted its worldwide total to $411 million, which was enough to get the sequel greenlit. Production on Pacific Rim: Uprising began in November 2016 in Australia. Filming moved to China in March 2017 and concluded later that month. Pacific Rim: Uprising opens in theaters on March 23, 2018.